House Democrats will take their first step toward obtaining President Donald Trump's personal tax returns, convening a hearing Thursday to examine legislative proposals and laws dictating the process to acquire the documents. The Ways and Means Subcommittee on Oversight will meet to hear testimony from a slate of experts on tax law, including a 1924 measure that allows the chairman of the exclusive tax-writing panel to privately examine anyone's tax returns. A majority vote from the committee would be required to publicly release the returns, if obtained. Democratic leaders have argued that the filings could produce a road map for investigations into Trump's tangle of global businesses and provide a cure for anxiety caused by his refusal to share details about his wealth, debt, charitable giving and potential conflicts of interests. The call for Trump to make public his tax returns dates back to the early days of the 2016 presidential contest, when he initially signaled he'd gather the volumes of documents that composed his returns and make them available for public inspection. As the campaign progressed, he dialed back that pledge, citing ongoing IRS audits that would complicate any attempt to make them public. Ultimately, the president never released them. "There's nothing to learn from them," Trump said in an interview with The Associated Press in May 2016. 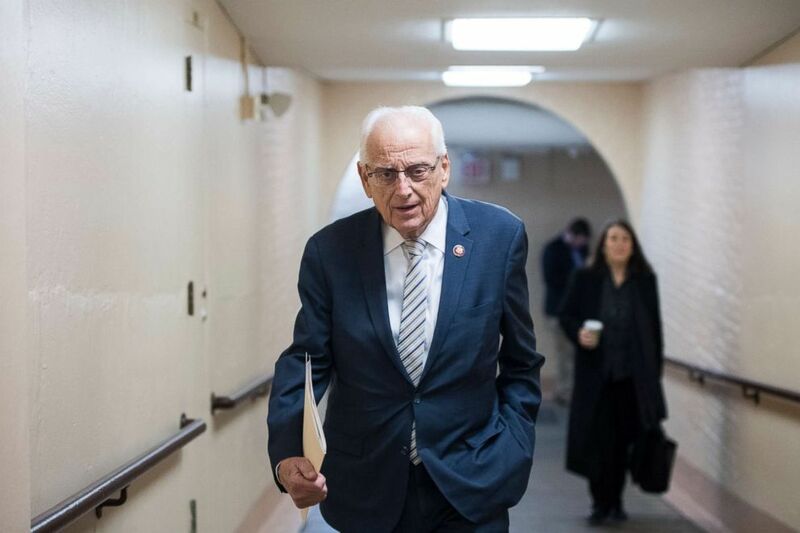 Rep. Bill Pascrell leaves the House Democrats' caucus meeting at the Capitol, Jan. 4, 2019, in Washington, DC. While some progressive Democratic lawmakers have clamored for the release of Trump's tax returns, House Majority Leader Steny Hoyer told reporters on Wednesday that it's "appropriate" to take a more cautious approach and hold a hearing before acting to obtain the documents. "A president of the United States is in a very unique position to individually do things, as this president has displayed probably more than most," Hoyer, D-Md., said. "And, therefore, it's important that the American people know whether the president is acting on their behalf or in his interest." "We'll see what the hearing comes out with, but I would expect at some point in time we're going to ask for the president's tax returns," Hoyer predicted. Rep. Kevin Brady, the top Republican on the committee who served as chairman during the last Congress and chose not to pursue Trump's returns, said GOP opposition is not necessarily over whether Trump should release his returns but more about "protecting the rights of every private taxpayer." "Weaponizing the tax code for political purposes sets a dangerous precedent," Brady, R-Texas, told reporters on Wednesday. "Because if Democrats or any party can abuse their power to rummage through the tax returns of the president, what will stop them from abusing that power in the future frankly to target any individual American that they see as a political enemy?" After Trump boldly advised Congress not to pursue "ridiculous partisan investigations" during his State of the Union address Tuesday, Rep. Bill Pascrell, a senior member of the Ways and Means committee, stressed that the U.S. has a "checks and balances government." 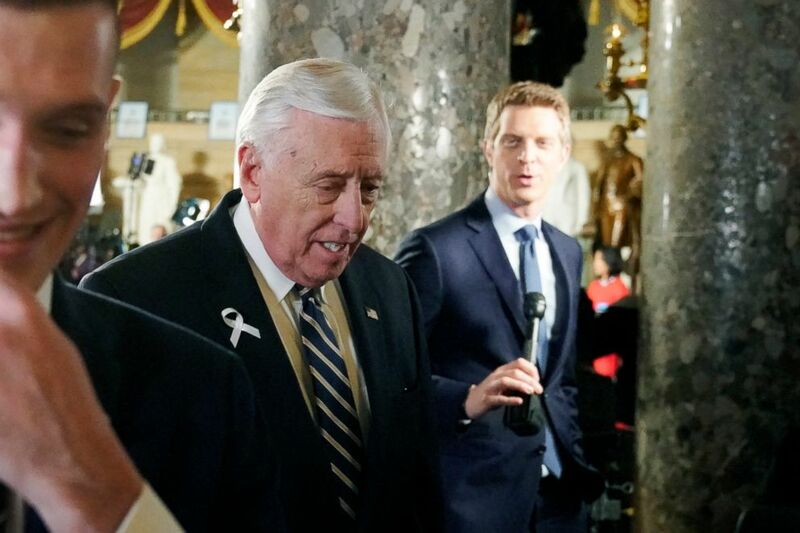 House Majority Leader Steny Hoyer arrives to listen to President Donald Trump deliver his State of the Union address to a joint session of Congress on Capitol Hill in Washington, Feb. 5, 2019. "This needs to be done methodically," Pascrell, D-N.J., said. "There cannot be an ounce of 'let's go get them.' That's never been my intention." Rudy Giuliani, a lawyer for Trump, has vowed to fight requests for the documents while the Treasury Department has signaled it would review the legality of a request, potentially prolonging the process via legal challenges. Five witnesses are expected to testify: Joseph J. Thorndike, director of the Tax History Project, an initiative from Tax Analysts; George K. Yin, the Edwin S. Cohen Distinguished Professor of Law and Taxation at the University of Virginia School of Law; Noah Bookbinder, executive director at the Citizens for Responsibility and Ethics in Washington; Steven M. Rosenthal, senior fellow at the Urban-Brookings Tax Policy Center; and Ken Kies, managing director of the Federal Policy Group.